If you’re still undecided about what to do with your mother this Sunday, plan an elegant lunch or dinner at home. 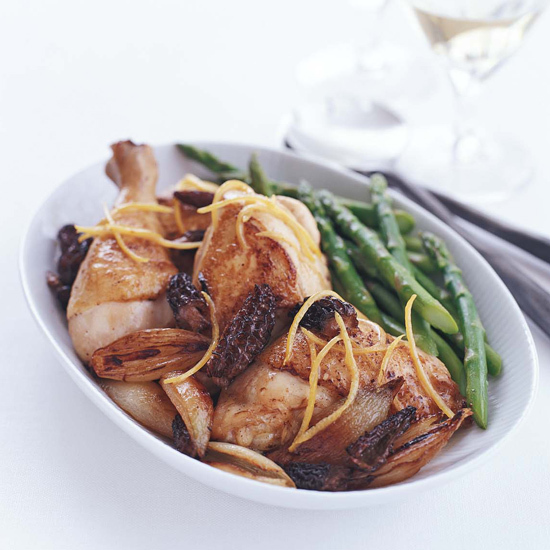 Chef and mom Katy Sparks created a vibrant Lemony Chicken Fricassee with Shallots and Morels that comes together in 30 minutes. By crisping the chicken in butter first, she adds quick flavor to the dish, which makes an ultra springy dinner party centerpiece. If saving family time doesn't appeal, David Bouley's Pot-Roasted Chicken with Mushrooms requires just over an hour of cooking for those who'd rather stay occupied in the kitchen while relatives sit back with refreshing cocktails.